The Toyota Tacoma TRD Pro is the high-performance version of the popular Tacoma mid-size pickup truck which comes standard with a strong V-6 unit and two transmission options. 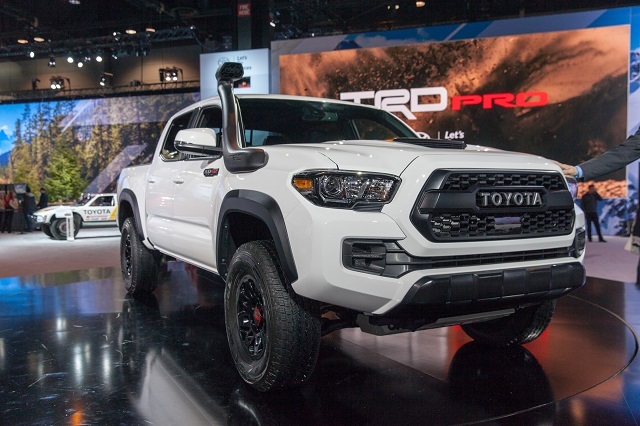 At the 2018 Chicago Auto Show, the Japanese automaker has announced that we can soon expect the TRD Pro versions of the Tacoma, but also Tundra and 4Runner models. 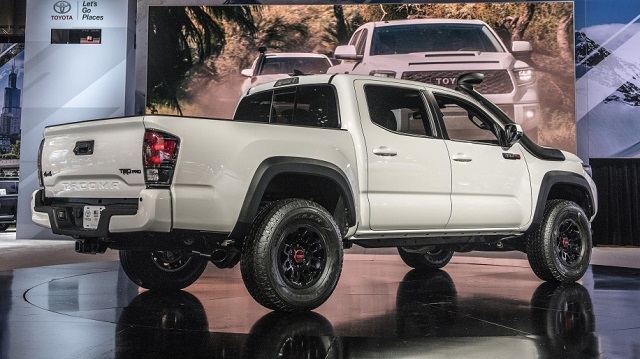 And according to the latest news, the newest 2019 Toyota Tacoma TRD Pro will bring some great improvements. This model has first debuted in 2015 and since then it hasn’t been changing much. However, with the introduction of the all-new Ford Ranger which is set to hit the road sometime during 2019, the Toyota automaker needed to make a few upgrades into its well-known Tacoma TRD Pro. First of all, there will be some changes in the external appearance such as new air intakes. In the tech department, we can expect a number of modern features despite its rugged appearance. Furthermore, the safety will be raised to the higher level with standard Toyota Safety Sense P. Under the hood, there shouldn’t be any changes expected. The 2019 Toyota Tacoma TRD Pro will feature the same engine as its predecessor. It is a 3.5-liter V-6 unit which is able to generate 278 horsepower and 265 lb-ft of torque. And there will be two transmissions in the offer: a 6-speed manual and a 6-speed automatic transmission. With the manual gearbox, this unit gets 17 mpg in the city and 20 mpg on the highway. Connected to a six-speed automatic, this engine is rated at 18 mpg in the city and 22 mpg on the highway. The power is sent to rear wheels but the part-time four-wheel drive also comes as standard. The first change we will notice about the exterior design of the 2019 Toyota Tacoma TRD Pro are some new details on the front. Its most noticeable thing is the new TRD Desert Air Intake. And thanks to the larger intakes, the Tacoma TRD Pro will be more capable in the off-road terrains. Furthermore, the new Tacoma will get a new skid plate with the red accent color in the TRD logo. As well, there will be new 16-inch alloy wheels with all-terrain tires and well-known TRD grille design. On the other hand, since the Tacoma TRD Pro is relatively a new model, we don’t expect any upgrades this time. The 2019 Toyota Tacoma TRD Pro will return with the same black seats with red stitching. And there will be the same TRD logos on the seat backs and floor mats. 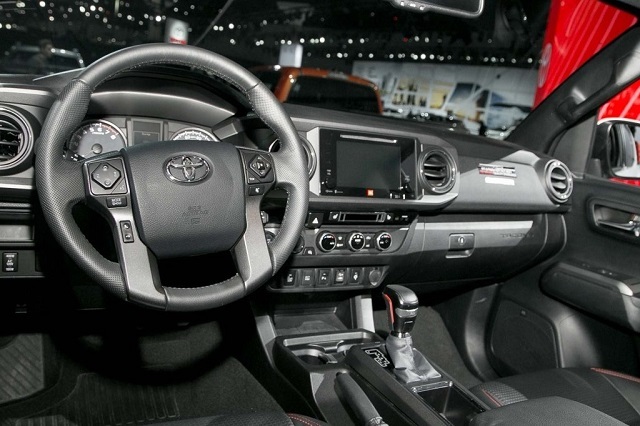 The dashboard is equipped with a 6.1-inch touchscreen for infotainment system. Unfortunately, the Apple CarPlay and Android Auto still aren’t available. However, it still has the Entune system, navigation, wireless charging pad and a premium JBL audio system. The 2019 Toyota Tacoma TRD Pro has been revealed at the 2018 Chicago Auto Show and should arrive later this year. Its starting price should be around $43,500.